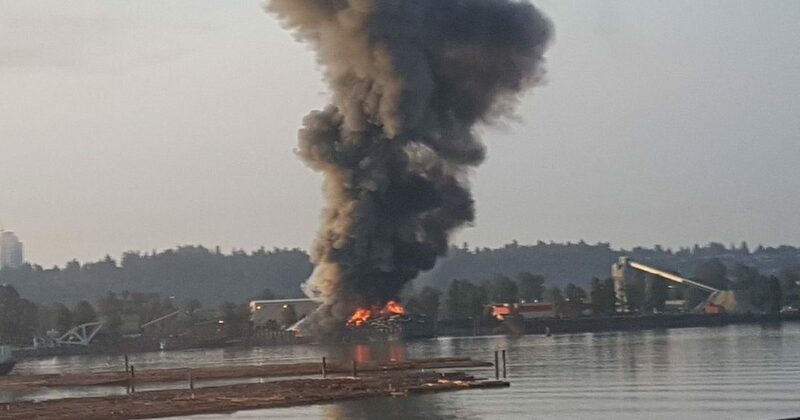 A large barge fire erupted in a Surrey early Friday morning, sending massive plumes of black smoke and flames into the air. Surrey Fire says crews are currently still battling the massive fire. From photos shared on social media, witnesses say the fire appears to be near the scrap metal recycling plant in Surrey. Witnesses have also said they can smell the fire across the river in New Westminister. At this time, there have been no reports of injuries, transit delays or road closures. I could see the smoke coming in from Langley on Fraser Hwy.